Some of your brain cells might contain tiny, magnetic crystals. Many animals, including certain birds and turtles, can find their way while migrating by sensing the Earth’s magnetic field. But humans never seemed to possess the ability to feel the earth’s magnetism — up until scientists pulled off a new experiment published Monday in the journal eNeuro. The scientists looked at the brain scans of people in an enclosed room where they generated a shifting magnetic field. As the field changed directions, parts of some participants’ brains’ electrical activity shifted as well. 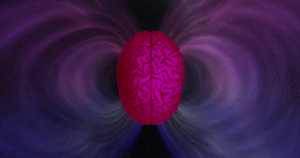 A major caveat to this research: the participants had no conscious knowledge that their brains were responding to a simulated shift in Earth’s magnetic pole, so scientists don’t yet know whether there are any behavioral or physiological implications to their findings. The scientists who conducted the brain scan study suspect that humans capable of this magnetoreception may have some sort of vestigial abilities from our genetic ancestors. This research didn’t answer how it works, but researcher Joseph Kirschvink, a Caltech geophysicist who worked on the study, suspects some brain cells may contain tiny, magnetic crystals.